ANU Union elections were held this week – with a twist. Rather than the usual Labor Left vs. Labor Students Club (Labor Right) contest, the two tickets, which released very similar policies, include members of both factions. Sources suggest both tickets were created by a deal between Left and Right, ensuring both factions will be elected. The ANU Union is a multi-million dollar organisation which operates the ANU Bar and Refectory Building. The Union aids students primarily by using revenue from shopfront rental to fund club grants, food aid, and competitions. Paid staff manage the Union’s day-to day-affairs, but the Board of the Union consists mainly of elected student representatives. Three of the candidates running in this election will serve as members of the Union’s Board, where they will make decisions concerning the finances and policy of the Union. Nominations for the positions were advertised through a post on the Union’s Facebook page, and through paper notices in the Union building. Members of the Labor factions, on condition of anonymity, told Observer that far from being in competition, both tickets were assembled by a factional deal. Specifically, Labor Left would not contest the election if Left candidates were included in both tickets the Right created. When asked about the Left-Right collaboration, We Need claimed the ticket “wasn’t based on factional lines,” and argued the presence of two Labor factions ensured “a broad range of voices are represented on the ANU Union board.” Sustain said “running from both sides equates to broader and stronger policy discussion.” Union elections have historically been met with low interest from the student body, and each year many students express confusion as to what the elections are for, or when nominations opened. 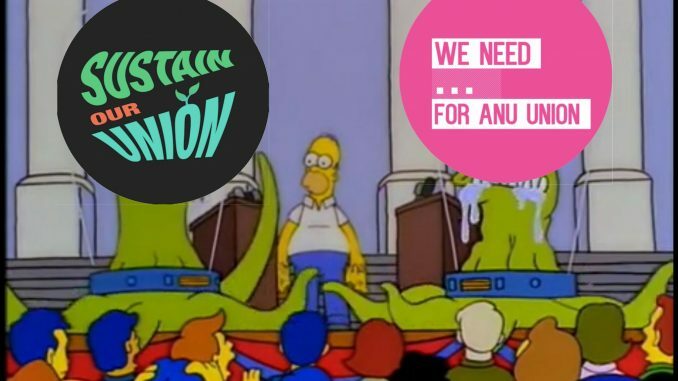 This year, nominations were advertised through a post on the ANU Union Facebook Page, and a paper notice in the Union building. Where policy is concerned, the tickets are extremely similar: both promise to continue current programs, negotiate with the ANU on the redevelopment, and continue the programs of the Union, though neither lay out specific strategies to achieve these goals. When asked to describe the differences between them, Sustain claimed they had more “caution in terms of the utilisation of Union funds,” while We Need said they would ensure “students’ needs are placed at the forefront of the negotiations” with the ANU. With the Union Court Redevelopment and ANU Bar closing, 2017 is a significant year for the Union, and many have asked how the Union will use its financial assets once the Union Building is demolished. Sustain promised the funds would be invested to “make dividends for students,” but did not provide follow-up on what these dividends entailed. We Need provided more specifics, claiming the money would be “returned to student services through grants,” but stated further information was held in confidence by the ANU Union Board at this time. A continued presence on campus after the Union Court redevelopment. An ANU Union that continues to offer the Food Aid Programme. Student’s [sic] voices to be heard and valued through a student run Union. To have a future focussed Union that can adapt and pre-empt change. To ensure that essential services are provided to members such as the Post outlet. Ensuring that Union assets are properly re-invested to maximise dividends for students. Negotiating with the ANU to ensure the Union maintains its presence on campus long-term. Growing student engagement, through improving the food-aid program and grants for student clubs and societies. Develop a viable long-term post Re-Union plan that puts the interests of students first.